Village Improvement Project (VIP, Liberia) is a recipient of our 2015 Feedback Fund. Recently they shared this insight with us. 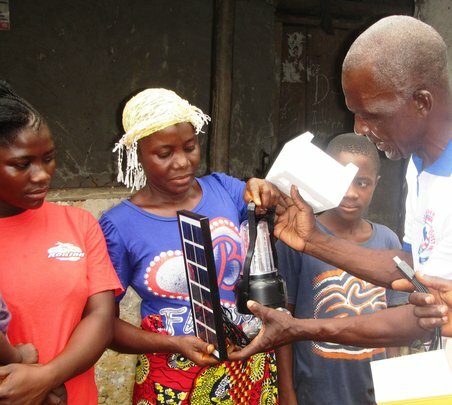 In 2015 we donated 180 solar lanterns to local people and erected road signs with the names of villages (so they would be “on the map” so-to-speak). With the Feedback Funds we received, we wanted to capture data on how well our beneficiaries use lanterns or what they think about road signs, identify problems/challenges, and gauge their satisfaction and impact. At first, we were too focused on having predetermined questions and standardized reporting. GlobalGiving’s team challenged us to simplify: Design our feedback around our audience and our goals instead. We explored automated phone surveys, but when we tested the system with our team, it became obvious it was too complicated for our communities. From this learning, we decided to use in-person interviews for feedback collection. Taking the time to try ideas and being flexible enough to change course was a valuable part of our learning. We will use this feedback to help us better understand what drives sustained adoption of clean energy and safe travel. Specifically, we want to first know are the lanterns and road signs useful, and secondly, what other resources are needed. If the lanterns and road signs are found to be useful, we will donate more lanterns and road signs to additional communities. If not, we won’t. If other resources are needed, we will research how to obtain those resources. Asking now will help us plan for programs in 2016 and beyond. palava hut (3 requests) and schools (3 requests). Having two feedback channels allowed us to experience various strengths and weaknesses of our strategies as well as capture informative data. Weakness: Extensive time travel and coordination for interviews. Rough roads damaged vehicle. time and cost was minimized for staff because there was no need to travel. We were able to interview 15 callers, 10 villagers and 5 visitors, from 14 different towns [one from the Gaynjabu village from the Lantern project]. We asked “Are the road signs useful?” and “Do you need something else?” All 15 callers indicated yes, the road signs were useful. Of these callers, 5 indicated that their villages lack road signs and feel the signs would be useful. We know that this doesn’t represent everyone, but it is a good sign that our signs are being seen.